Gem Drop is a brand new online slot machine from Play N Go with, as you might already have guessed, sparkling jewels and other precious stones as it’s subject. Appropriately enough its also features a progressive jackpot which means those diamonds and rubies could be yours if you are lucky enough to win one of the huge prizes on offer. 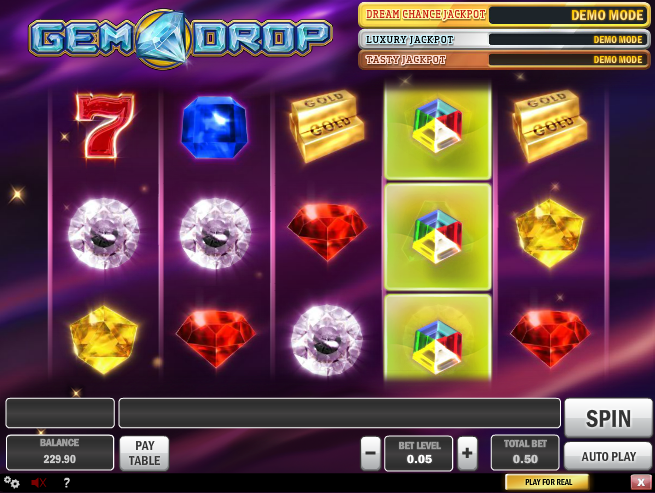 Gem Drop features five reels and ten fixed paylines and it’s certainly a smooth-looking and polished game which sparkles from every square inch of screen space. There are a couple of interesting bonus games, one of which can win you the progressive jackpot. Six different coloured jewels are the basic symbols – red, green, blue, yellow, white and turquoise – and then there’s a traditional seven and a pile of gold bars as the more expensive ones. The only bonus symbol is a multicoloured wild. It’s possible to make winning paylines here from right to left as well as left to right. This is an interesting feature and it’s randomly awarded; there are no wilds on the reels during the base game but occasionally those reels will change colour slightly during a spin and you will see lighter objects moving on the screen. They will slow down and stop shortly after the reels stop and if they appear on screen they turn wild, hopefully helping you win. You will now get one more free respin and the wild or wilds will remain in place. Three gold rings – you will play the bronze wheel of fortune with a chance to win a cash prize, the Tasty Jackpot to or move on to the silver wheel. Four gold rings – you will play the silver wheel with a chance to win a cash prize, the Tasty Jackpot, Luxury Jackpot or to move on to the gold wheel. Five gold rings – you will play the gold wheel with the chance to win a cash prize, the Tasty Jackpot, Luxury Jackpot or the Dream Chance Jackpot. 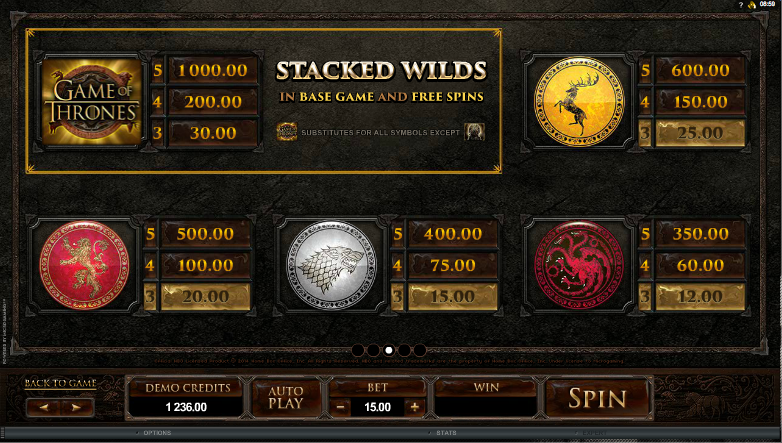 You can gamble your most recent win by electing the ‘Double Up’ or ‘Triple Up’ buttons below the reels. All you need to do is pick one of the symbols and hope it rewards you with a win rather than a loss. You can guess correctly up to ten times. Don’t be tempted to gamble every win – it’s the surefire way to shrink your bankroll. Do it occasionally and don’t expect to win every guess. This is a quality game and reminiscent of some of the better Net Entertainment slots such as Starburst or Reel Rush; the progressive jackpot makes it an enticing prospect indeed.